Join the Movement! Your right to choose your own rehab professional for your pet is at stake! 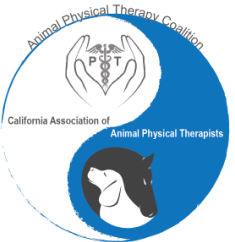 We are seeking like-minded individuals and organizations to come alongside us as we lead the development of legislative and regulatory language that will protect consumers’ rights to choose their own qualified animal rehabilitation professional. California does not need a veterinary monopoly. 1. In particular, we need funding to cover fees for lawyers and lobbyists, as well as travel expenses associated with attendance at political events and meetings. 2. Write your local legislator and let them know this matters to you. Click here for complete details on how to contact your legislator. We invite you to join us in our quest to do what is right for the animals and consumers of California. Encourage your Assemblymember to VOTE YES on AB 3013! TAKE ACTION! Here's how you can help! Please note: Donations made to APTC/CAAPT will be used for political activity and are therefore NOT tax-deductible. TO HELP FUND THIS CAMPAIGN, WE INVITE YOU TO VISIT OUR ONLINE STORE FOR GREAT APPAREL DESIGNED FOR DOG LOVERS! ALL PROCEEDS GO TO THE APTC/CAAPT TO FUND THIS LEGISLATIVE EFFORT. CLICK HERE TO VISIT THE APTC/CAAPT ONLINE STORE. JOIN THE MOVEMENT AND WEAR CUTE CLOTHES!